THE ARTS+ and NEM invite you to participate in the CALL for interest for the Working Summit on Innovation in the Cultural and Creative sectors: How to support technologically triggered innovation. 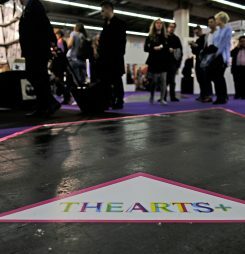 THE ARTS+, the business festival for the creative sectors, was set up in 2016 by the Frankfurter Buchmesse. This year, it will host a Working Summit on Innovation to support the exchange between policy, research, industry and intermediaries when it comes to new technologies & innovation support for the creative sectors. The Summit will consist of 2 round table events in the “Salon format” and a guided tour. Each event will be a meeting point for up to 60 top representatives of politics, industry, cluster organizations, associations and pioneers of the cultural and creative industries. Startups, entrepreneurs, policy stakeholders, intermediaries, cluster organizations -¬‐ trailblazers of the cultural and creative industries: Listen up! THE ARTS+ is looking for creative minds who harness new technologies to drive innovation and business in the creative sectors forward. To support a growing ecosystem of stakeholders engaged in innovation support for the creative sectors we are reaching out to you. We are looking for very different people from all over Europe: from creators to companies to intermediaries -¬‐ like assocations and cluster organisations -¬‐ to policy makers. Are you a pioneer – working across the frontiers of sectors and disciplines? Are you interested in the intersection of culture, business, technology and politics? Do you use or support new technologies like 3D printing, Virtual Reality or Artificial Intelligence to create new products, services and experiences? Do you have a view on and experiences with innovation support programmes on a national or European scale (like Horizon2020, Creative Europe, European Structural and Investment Funds….)? Do you have an interest in the way the public and private sector should ideally work together in order to support innovation in the creative sectors? We will select 30 participants altogether resulting from this call. If you are the winner, you will be able to take part in the high-¬‐level Working Summit on Innovation for the creative sectors at THE ARTS+, which takes place on Wednesday 11 October. This workshop is by invitation only. The selected participants will also participate in dedicated networking formats and be featured within the international communication campaign of THE ARTS+.